[High quality PU foam] sponge charm is really comfortable touch, realistic look, sweet smelling. If you mind the smell, please put it in a ventilated place for a while. [Slow rebound] Elastic, slow rebound and environmentally-friendly. No matter how hard you pinch them, they will slowly return to the original shape, very interesting. 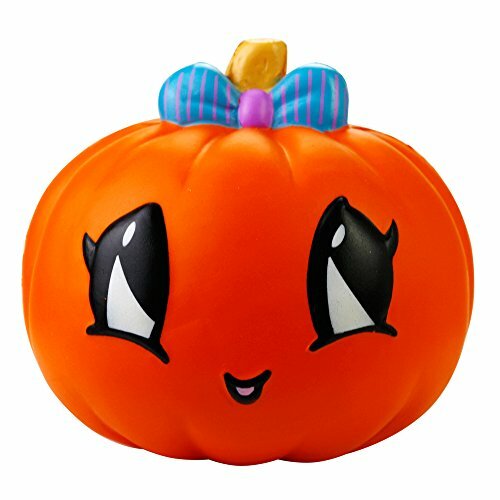 [Pumpkin design] Whenever you feel bored or stressful, just squish our lovely mini toys. Let your emoticon get vented, stress relief, fun-also effective for focus and deep thought. [Decompression] Can be toys for decompression and venting emotions, tools for finger rehabilitation training and wrist rest pad, samples or decorations for display in the bars and fruit shops, gifts for birthday party, preschool props and teaching aids. [Notice] Please do not let your children eat the item,or put it in the mouth.If tear it,it will break.